At the time of this photograph he is almost 3 1/2 years old. 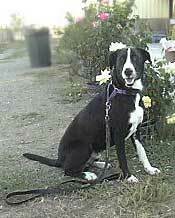 This is our first attempt at AHBA Herding Ranch Dog I. While I'm disappointed that I didn't qualify our first trip out I'm not completely disappointed in our performance. Poor Tsuki is handicapped by an inept handler. When I'm inept, he turns to puppy brains. When I remember what I'm doing, then so does he. I reviewed the video tape of our run. It sounded terrible, but it didn't look as bad as it felt. Although in the video I keep yelling at him to "Lie Down" I think the main thing I need to get from him is an easy or slow down . At least I can trust that he won't bite or otherwise try to injure the sheep. And I like our gate work. Once I've settled him into a "hold" he stays there. He doesn't try to go through the gate after the sheep. It was a very straightforward course. No fancy embellishments. Enter arena 1. 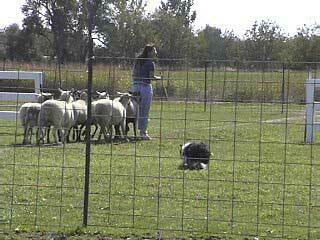 Set the dog a post C. Handler (at my level) can walk within 15 feet of the sheep. Problem was I actually tried that. And as soon as Tsuki moved the sheep bolted practically right over me. I'm supposed to stop him when he gets around them. Either I didn't or he didn't. Anyway the next step is to take the sheep counterclockwise around an orange cone at the other end of the arena. This actually we accomplished, although only in a minor way due to my "handling". Most of that first arena was a blur. It went waaaay too fast. Anyhow around the cone to a point on the fence roughly midarena with a #5 label. Then 90 degrees through a set of panels. I did those literally at a run. directly across to #4 on the fence opposite. That happened too. Next was the gate. Duh - I stopped the sheep on the wrong side. I did the same thing in practice. So double duh. But somehow we got through that without a disaster. Now the tough part, for us. We are in an alleyway. I knew the sheep would make for the far end. What I didn't count on was the sheep getting stuck in a corner at the near end. That is the typical ENTRANCE to their set outs. It had been nicely blocked off with stock panels but some earlier sheep (not ours) had actually crashed through the panels in an effort to rejoin their flock. My group were thinking about it. The problem was every time I got them out of the corner they ran back down the alleyway. And the corner they were in needed Tsuki to work on his bad side. 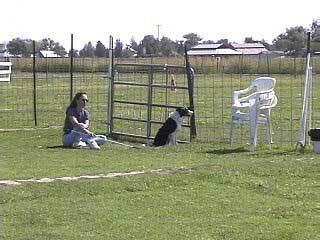 I would get Tsuki working nicely then the sheep would take off and get him all excited again. Finally I grabbed his collar and helped him get the danged sheep out of the corner. HA! that actually worked and I managed to get them where I needed them, up against the gate for a gate sort. Let five into the next arena, leave the other five. THAT one worked fine. Tsuki did a nice hold, five and only five sheep went through. I had to remind Tsuki NOT to go get the sheep we were leaving. 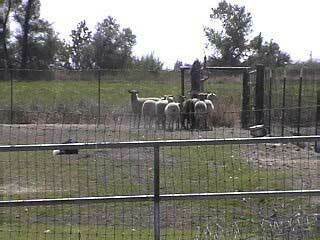 Next was to take the sheep through another set of panels and to another gate. That worked OK, although still too much speed and too much me yelling and being ignored. Still we did what we were required to do. Next was going through the gate into arena number three and a Y chute. There Mr. Puppy brains reemerged and more importantly I was totally fried. I quit after it was clear he was not listening, and I wasn't making good decisions. That's April and Epic. They did a great job on the course. Second place, and reserve High in Trial. Epic and April are a great team. I love watching them work. Our next chance is in November. Til then Tsuki says bye-bye.